Untreated Lyme disease can display a range of symptoms. These symptoms might occur in stages, i.e. within 30 days of the tick bite and then after 30 days. 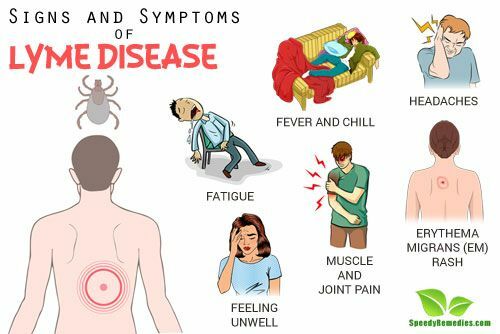 Lyme disease can be categorized into stages as early localized disease, early disseminated disease and late disseminated disease. EM rash, or bull’s eye rash is flat or slightly raised red spot on the area of tick bite. It begins in about 7 days after the bite, although the time period can range from 3 to 30 days. The rash keeps expanding gradually, expanding up to 12 inches. It is usually not painful or itchy, although may feel a bit warm to touch. If left untreated, the rash can continue for about 4 weeks or more. Signs indicating the onset of third stage can occur months or years after the infection starts. This is the stage when the disease has completely spread to each and every part of the body. The symptoms experienced in this stage are severe and can be disabling and sometimes permanent. Lyme arthritis which affects the knees although, it can affect other joints like shoulders, ankles, elbows. The pain is usually mild but there might be a swelling. If the right antibiotics are provided at an early stage, Lyme disease can be completely eliminated and people are cured most of the time . Antibiotics commonly used for oral treatment include doxycycline, amoxicillin, or cefuroxime axetil. Patients with certain neurological or cardiac diseases may require intravenous treatment with drugs such as ceftriaxone or penicillin. To prevent contracting the Lyme disease, you have to protect yourself from ticks so that they don’t bite you. Be careful during warmer months as it is during this time that ticks are commonly found. Do not go hiking into areas with tall grass or woods during summers. If you do go hiking, remember to cover yourself by wearing full sleeves shirt and long pants with the pants firmly tucked inside the socks so as to avoid any exposure. Spray insect repellent on your body as well as your clothing. Wear light colored clothing so that any ticks on your clothes can be easily spotted. After reaching home, check all your clothing and body thoroughly. Take a bath as soon as possible to remove any unseen ticks. Wash your scalp properly. Put your clothes in a hot dryer to kill any pests that may have clung on to it. Never, ever use your fingers to remove the tick. Use tweezers to grasp the tick close to its head or mouth. You can use a paper towel, if needed. Pull it out in a steady motion. Do not crush or squeeze the tick. If a part of the tick remains in your skin, try removing it with tweezers. If it cannot be removed, go to the hospital. After it’s out, clean the area with rubbing alcohol or soap and water. Remember to wash your hand too. Put the tick in a jar. If you notice any symptoms of Lyme’s disease, go to the hospital, taking the jar with you.